Because I was just amazed by a recent showing of fencing at the London Olympics, I decided to dedicate this post to the 2012 Olympics, and feature a painting of a sport that is played in the Summer Olympics. 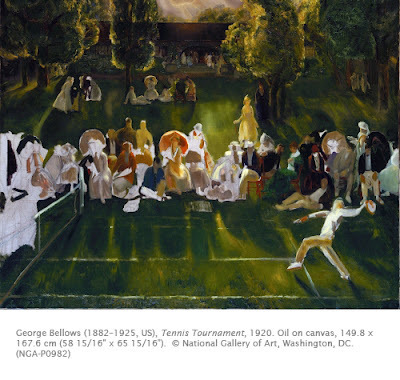 I always watch tennis when it’s on, so I present to you this work by George Bellows of tennis at Newport, Rhode Island. Most people only associate Bellows with the Ash Can School of painters at the turn of the 20th century, but few know that he was actually offered a position on the Cincinnati baseball team at the time, but turned it down in order to pursue a career in art. Please don’t ask me what the name of the Cincinnati team was at the time, I think (but, I’m not sure) it’s the Reds now. 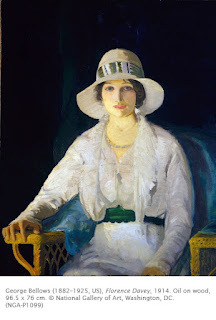 Although George Bellows is often associated with the group of Philadelphia artists known as the Ash Can School for their paintings of gritty scene of urban life in New York, he initially did not exhibit with the eight original artists. He eventually, however, became a leader in the group. 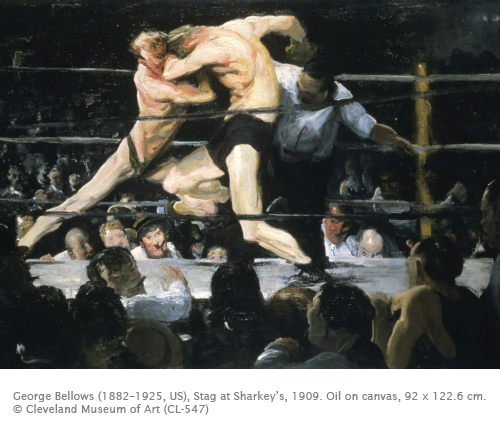 Bellows was born in Columbus, Ohio and studied art at William Merritt Chase’s School of Art in New York in 1904. Chase (1848–1916) was a leading American Impressionist. At his school, Bellows came under the influence of the leader of the Ash Can School, Robert Henri (1865–1929), whose style is often characterized as “Dark Impressionism” with emphasis on dramatic lighting and slashing, fluid brush work. His painting was also influenced by the impressionist palette as transmitted through Chase, who had painted in France. Bellows is remembered more for works such as this, with a dark palette typical of the Ash Can School. However, he also produced such high key works as this one with a decidedly impressionist palette and interest in the fleeting effects of light on his sitter. It could be argued that even his gritty scenes of urban life dissolve into large brush strokes that suggest light struck forms. However, I prefer many of Bellows later pieces because his palette became decidedly richer. Bellows produced various versions of prize fights in New York. He also produced many versions of tennis games, both in paintings and prints. 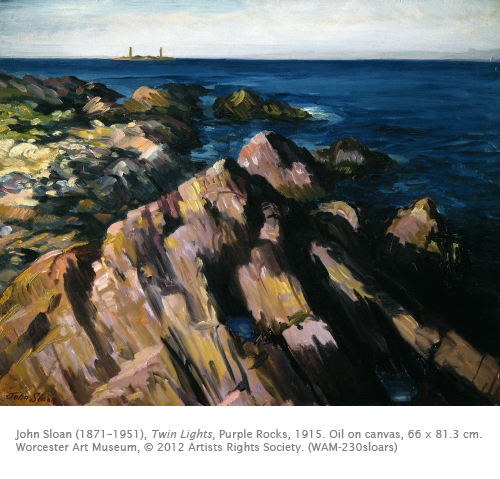 Such light-filled, high-valued coloristic works show the duality of Bellows’ style. At the same time he was painting gritty street scenes of New York, he was also admitted as a full member to the conservative National Academy of Design. Such tennis paintings are a smorgasbord of atmospheric light and movement, hallmarks of Impressionism, while satisfying his interest in sports. I have to say I prefer this palette to the more academic one he uses for his urban scenes.